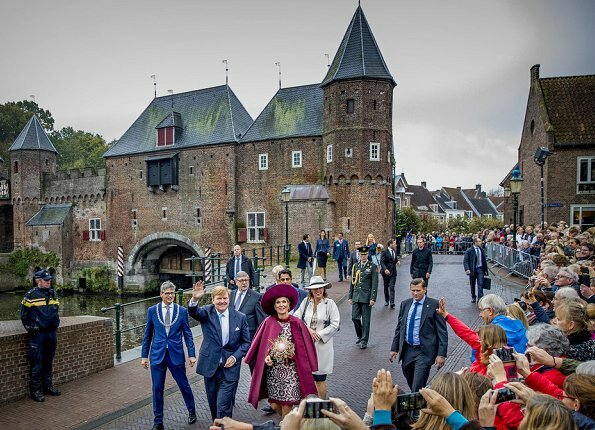 On October 24, 2017, King Willem-Alexander and Queen Maxima of The Netherlands visited the city of Amersfoort during their region visit to Eemnland in Amersfoort, Netherlands. 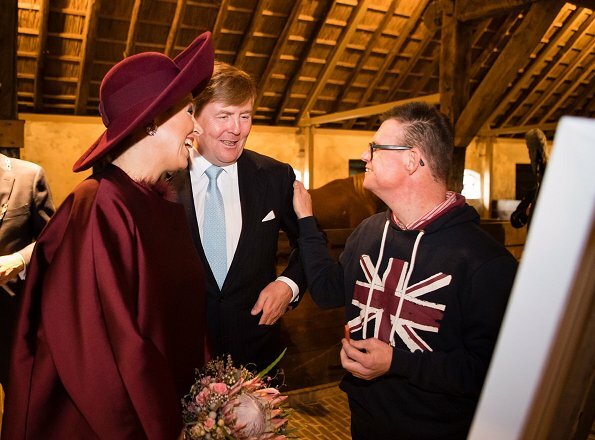 The Dutch Royal couple visited Amersfoort, Koppelpoort and Eemhuis cities in Eemland region. The Queen wore a new Natan branded silk coat and dress. Oh boy.....that fluffy stuff around the sleeves, neck and hem! Des plumes puisque la fourrure est mal vue . Quite a stable fashion! This outfit is very much Maxima, too much really but beautifully styled together. Mens, erger je niet zo, altijd te klagen. 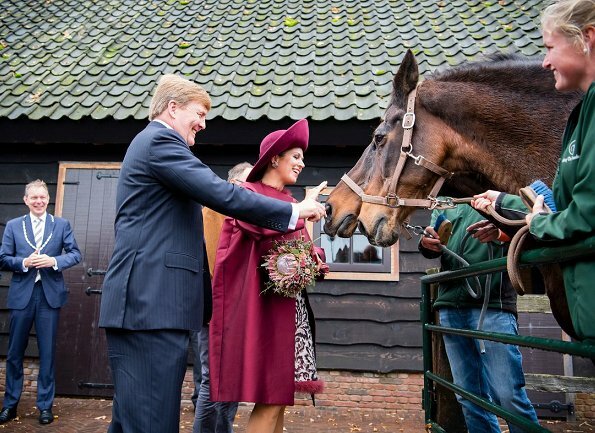 Focus je op de positieve energie die Maxima overbrengt naar alle aanwezigen in deze plaatsen! Maxima peut tout porter, tout lui va, même un sac de pommes de terre aurait de l'allure sur elle. What a contrast between Maxima and the dull gray weather! She really is a dash of happiness and color! I actually like the dress. As Blondini said, there is thought behind the styling and accessories. Even the earrings pick up very subtle colors in the ensemble. Probably there is also thought behind the styling of that guy on the second picture. A Union Jack on the shirt? What does he want to say? That he wishes there was a bit englishness about her majestys appereance? The so-called cape has sleeves of a sort, so it's not really a cape, more like a cape-like coat. The color is beautiful, too bad the dress and the hat are not. one of these days she's going to fly away with her hat. First Impression: that Outfit is very Queen Mum like. But Maxima can get away with it. Flamboyant and not so bad. Very Maxima. This is over-the-top for where she is wearing it. But that's Maxima! I love the colour but the fury trim is actually horrible. And it is a coat, not a cape - the sleeves are clearly visible - so I wish she wore it as one, not as a "cape ". Only Maxima can carry off a dress like this. Kuddos for individuality! J'aime beaucoup maxima toujours très royale mais un peu de simplicité ne gâcherait rien de temps en temps. At last !!!!! Maxima wears a really beautiful ensemble !!! Love it !!! 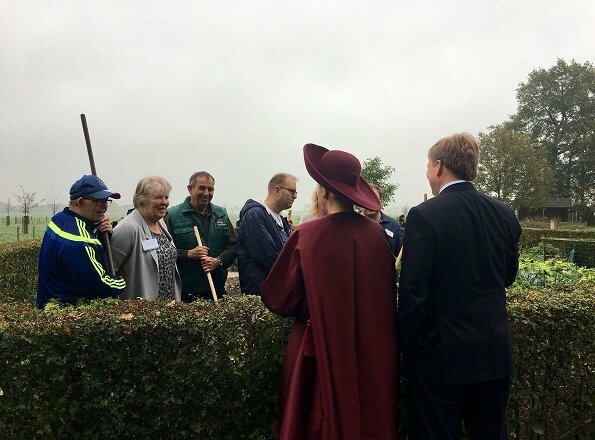 Zeer mooie en verzorgde outfit. Wat een speels accent vormen die pluimpjes.Ja, maxima komt hiermee weg.